If you can resist getting swallowed up in her painfully adorable marble-sized eyes, it’s not hard to see how incredibly debilitating her disorder is. In fact, the premise of the film is that Dory’s faulty memory has caused her to lose and forget her family, but as she starts to recall vestiges of long-lost memories, she begins a heroic quest to find her parents again. Thus, following last year’s hit Inside Out that took place inside a child’s brain, Disney/Pixar’s story once again brings a central topic in neuroscience into the spotlight. Although Finding Dory is by no means a film strictly about memory, the character of Dory provides a glimpse of what it might be like to suffer from memory loss and how important memory is in our day-to-day lives. If we put on our psychiatrist hats and try to diagnose Dory’s condition, we might get a little confused. She certainly doesn’t have Alzheimer’s, since it is a disease involving brain degeneration whereas Dory appears to have been born with her memory problems. Her condition has some similarities with Korsakoff’s Syndrome, but this is most commonly caused by alcohol abuse, and we have no reason to believe that Dory has any experience with alcohol at all (though maybe scenes of Dory excessively binge-drinking were cut from the film to obtain a PG rating?). Other memory conditions are usually caused by serious forms of brain damage, which again we have no evidence that Dory ever experienced (unless her sleep-talking in Finding Nemo when she said “careful with that hammer” was some sort of clue…). No, Dory’s condition may not be “real” in any strict sense – in fact, her condition was probably nothing more than the filmmakers’ playful take on the busted myth that fish have a “3 second memory”. Nevertheless, we can use Dory to examine some of the most fundamental aspects of our brain’s memory system. Dory introduces herself as having short-term memory loss to practically everyone she meets, but what exactly is short-term memory? Short-term memory can be thought of as the bridge between an experience and long-term memory. Information about the experience hasn’t yet been fully consolidated into a stable, long-lasting memory, but we still have access to that information on a limited timescale. In modern psychology and neuroscience, we tend to instead use the term “working memory” to refer not only to the storage of information in the short-term, but also to the mental processes for using and manipulating that information . “Short-term memory” as it is portrayed in Finding Dory is a bit misleading; it suggests that there’s a sort of waiting room in the brain where information waits for a fixed amount of time, and once its time is up, the next doorway to long-term memory automatically opens. In reality, the process of memory consolidation is much more complicated than this; there aren’t discrete “rooms” in the brain devoted to short-term or long-term memories, and the transfer of memories into long-term storage is not a passive process. Memories themselves can be peppered throughout the brain, although some regions do play special roles in their creation, maintenance, and retrieval. Lateral prefrontal cortex (PFC) in working memory: In recordings from single cells in monkeys (a) and fMRI brain imaging data in humans (b), high neural activity in lateral PFC persists even when the sensory cue is no longer present (e.g., during delay period ‘D’ in (a)) . To explore this, let’s use a scene from Finding Dory in which Dory is desperately trying to remember the directions through the pipes of the Marine Life Institute to find her family. Once a crab named Carol finishes giving her the directions (and thus the sensory input, i.e. Carol’s verbal instructions, is no longer present), Dory immediately starts repeating the directions out loud to herself over and over in a desperate attempt to prevent them from slipping away. By doing this, she is trying to maintain the address in her working memory, but unfortunately, she only lasts about 10 seconds in the pipes before she is completely lost. Working memory has been shown to rely heavily on the lateral prefrontal cortex (PFC), which stays active even when a sensory cue is no longer present. In other words, the brain is able to hold on to some sort of representation of that information even when the source of the information has disappeared. There is some evidence that this persistent activity represents the PFC’s “reactivation” of the sensory cortical areas that were initially activated by the source . For most of us, remembering the crab’s directions wouldn’t be a terribly hard task and we could do it silently, but Dory may be repeating the directions out loud in order to help the PFC with reactivating the parts of her brain that initially processed Carol’s verbal directions (e.g., the auditory cortex). Hippocampus in long-term memory: Patient H.M.’s brain (left) was missing its medial temporal lobes (including hippocampus), rendering him unable to form new memories. On the other hand, contrary to her own diagnosis of “short-term memory loss”, Dory’s memory problems aren’t restricted to the realm of working memory. After all, she can’t remember where she’s from, who her parents are, or just about any of her childhood by the time we meet her as an adult in Finding Nemo and Finding Dory. Clearly, some elements of her long-term memory are also affected. Whereas working memory relies heavily on the prefrontal cortex, the hippocampus is particularly important for the consolidation of “short-term memories” into long-term ones (for instance, if Dory had needed to remember the directions through the pipes for a later time). Much of what we know about long-term memory comes from the famous patient H.M., who had a surgery that removed golf ball-sized chunks of his medial temporal lobe from each hemisphere, including the hippocampus. After the surgery, H.M. suddenly had a severe case of anterograde amnesia – in other words, he couldn’t form any new memories. Nevertheless, he could still remember events from his distant past, and he could even remember a 3-digit number for as long as 15 minutes if he continuously rehearsed and repeated the number (suggesting that his working memory was intact, unlike Dory’s) . In this way, Dory more closely resembles another famous patient named Clive Wearing who suffers from chronic retrograde (memories from the past) as well as anterograde amnesia. Ever since contracting a severe case of Herpes encephalitis that ravaged his hippocampus, he can neither remember details from his past nor transfer new memories from his short-term to long-term memory. As you can see in the following video, he resembles Dory in that his memory only lasts about 7 to 30 seconds before his consciousness presses the restart button. But remarkably, Clive still possesses some aspects of memory. He still perfectly remembers how to play the piano (as example of intact procedural memory, which interestingly does not depend on the hippocampus), and he continues to recognize his beloved wife Deborah without fail. Dory, too, is not completely debilitated; she still remembers how to speak whale, and she never fails to recognize Marlin or Nemo. She even has moments when her memory suddenly seems to kick into high gear, like when she surprises herself at being able to recall “P. Sherman 42 Wallaby Way, Sydney” with ease in Finding Nemo. 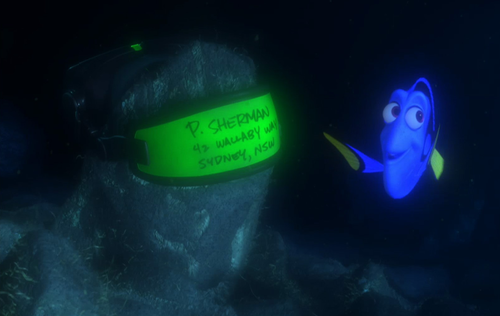 Dory had no problem remembering this address in Finding Nemo…what’s up with that?! However, while both H.M. and Clive Wearing are unable to form new memories, multiple lines of evidence suggest that Dory’s memory deficits differ in a fundamental way. In Finding Dory, there are multiple scenes in which old memories suddenly rush back to her, suggesting that Dory may have a problem with memory retrieval rather than memory encoding. In other words, those memories are somewhere in Dory’s brain, but the normal mechanisms for voluntarily bringing those memories back into her consciousness aren’t quite in working order (see a previous post about forgetting for more information on why we might fail to remember). For example, many patients with damage to their prefrontal cortex have trouble not only with complicated working memory tasks, but also with recalling previously-remembered information . Thus, Dory might be best thought of as having trouble with some of the executive functions governed by the prefrontal cortex, including attention, working memory, and voluntary memory recall. Yet the PFC isn’t the only mechanism for retrieving old memories, hence why Dory is eventually able to piece together the events leading to her separation from her parents. A recent study offered evidence that the hippocampus (discussed above) binds together different elements of an event in one’s memory such that retrieval of one of those elements triggers the retrieval of the whole event . For instance, in Finding Dory, seeing a trail of shells jogs Dory’s full memory of how she lost her parents in the first place. This study suggests that the hippocampus underlies some involuntary aspects of remembering, which Dory still seems to have intact. Perhaps diagnosing Dory’s condition is a fruitless endeavor. After all, let’s not forget that she is a fish, not to mention a fictional one. Consequently, her brain is very different from that of humans, particularly when it comes to the prefrontal cortex (i.e., she doesn’t have one). But Finding Dory is not meant to be scientifically accurate in any way. Its real purpose and power is in exploring the challenges of living with a disability, using memory loss as an example. Nevertheless, I can’t help imagining little kids leaving the theater and asking their parents, “what is short-term memory loss?” So even though Dory’s form of memory loss is specific to a fictional Pixar fish, it provides a window through which to examine the true neural underpinnings of memory.